Comments Now here is one of the beautiful gems that sold off, no sooner it came in! The discerning patron knows when not to waste time in thinking over rare treasures of the earth. Featured today is a completely natural, unheated and treatment free Blue Sapphire from Srilanka. The oval cut blue sapphire of 1.63 carats is a wonderful deep royal blue that reflects the color of midnight skies in summer! The gem has fantastic clarity and has been set in sterling silver as a Saturn talisman ring. What sets aside the Srilankan Blue sapphire from rest of the blue sapphires is the good color, excellent clarity and the sparkly lustre, which is to say that these gems score really well on the 4 C’s among natural treatment free blue sapphires from other sources. Just put one of the Srilankan Blue sapphire next to a blue sapphire from any other source and you’ll know what we mean. Blue Sapphire or the neelam gemstone is the gem of Lord Saturn / Shanidev and is used to harness his saatvik energies that can lead to transformation and qualitative changes in life. A planetary gem with such clarity can promise to clear any confusion in life and move ahead with focus and determination. In deference to the mystical planet Ketu or the South Node of the Moon, the new lot of natural, treatment free Chrysoberyl cat’s eye gem from Srilanka has been named Zephyr 2012. Zephyr, like this ethereal mystical planet itself. Cat’s eye is also known as Lehsuniya/ Vaidurya/ bidalaksh or Sutra mani and set in a talisman is used to harness the energies of Ketu. Superior cat’s eye gem is a phenomenal gem that is translucent and displays chatoyancy – where a band of light is visible across the surface of the gem when light falls on it. This straight band of light gives it an appearance similar to that of a feline’s eye. All the planetary gems at Gemstoneuniverse are assessed for doshas mentioned in the sacred texts. They are approved and made available only when they pass muster. One thing that almost always raises a question from the patrons is about the rough underside of the cat’s eye gem. Being a cabochon (highly polished, domed upper surface) gem and then alongside being a phenomenal gem(displaying the phenomenon of chatoyancy), there is a danger of this gem losing its special chatoyant effect in the process of being cut, formed or finished to complete aesthetic proportions. Therefore, in most cases you will find that the underside of the cat’s eye is left rather crude or unfinished. So when you see a cat’s eye with rough surface on the underside, drop your doubts and go ahead with complete confidence, so long as you are provided the gem certification for authenticity. Note: The appraisal and certification of this lot is complete and the gems should be available online shortly. Comments When you see a masterpiece, words fail you and you wish that the stunned silence of awe and wonder could be translated into words, to express emotions stirred by such beauty! And then there is the unending train of exclamations —OOHHHs, AHAAAs and WOWs. Breathtakingly beautiful is the ring featured today. Spectacular collector’s piece of jewellery – natural Sri Lankan Chrysoberyl Cat’s Eye surrounded by Diamonds set in 18-karat white gold. A Natural chrysoberyl cat’s eye of 3.84 carats from Sri Lanka sits as its centerpiece. The fully natural Neptune green cabochon gem has a sharp chatoyant band running across it. What makes it spectacular is the design element with 42 natural diamonds weighing a total of 62.3 points/cents that highlight the magnificence of the natural cat’s eye gem. The chrysoberyl cat’s eye gem is known for its chatoyancy – a phenomenon in which, when the light falls on them, the silk-like inclusions form bands across the gem that appear to open and close just like the eye of a cat! Cat’s eye also known as Lehsunia or Vaidurya or sutra mani is used to harness the power of Ketu. Cat’s eye is the gem of Ketu or South Node of the Moon or the Dragon’s anti-node. 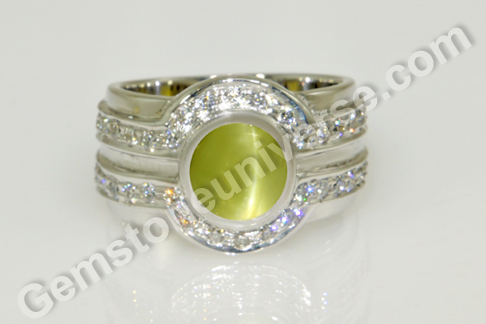 The use of cat’s eye and diamond combination in a ring is the typical gamblers lucky talisman or charm. 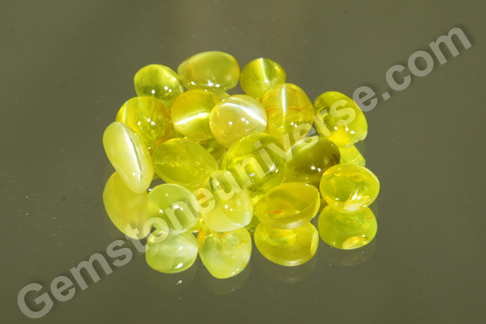 Cat’s eye gem is used by astute individuals who are aware of its power with respect to games of chance. Comments There are energy portals in our body known as the chakras and gemstones influence energy exchange at these portals directly. The chakras are the nodes where the positive energy can be received. The gemstones work on harmonizing the vibration of the individual and bringing it in sync with the universal energy. Featured today is a 4.50 carat fully natural and organic red coral from Italy set as a Mars Talisman in a sacred chakra ring. The red coral has a smooth and blemish free surface highlighting its coveted Mediterranean ox blood color at its best. 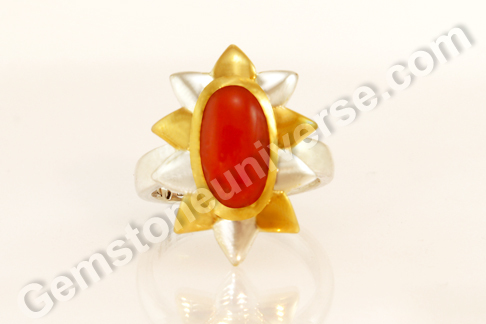 The natural red coral has been fashioned as a cabochon as it is an opaque and organic gem. Natural Red coral or Munga/ Moonga is the gemstone of planet Mars also known as Mangal/ Kuja/ Angaraka. He is the planet who is the chief of the army of Gods. The third chakra or the Manipura chakra is represented by a 10 petalled lotus (the ring has a ten petalled design emulating this symbol) and is the center of vitality and will power. 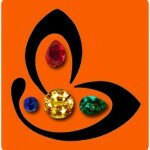 The energy of the gem certainly resonates with the functionings of this chakra. The Mars energies harnesses through a red coral talisman can help and heal with issues of discipline, determination and courage. Note: Thank You dear patron for your gracious testimonial and also sharing your experience extensively. 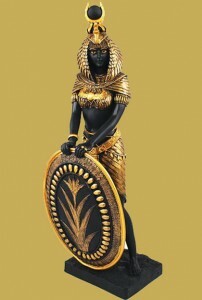 Comments If you have the vision, we can create a masterpiece to your liking. Just like the ornate finger ring featured today. Hold your breath for it is a breathtaking beauty that has a fully natural and treatment free Colombian emerald. The gem does not even require a second look to figure how special indeed it is! 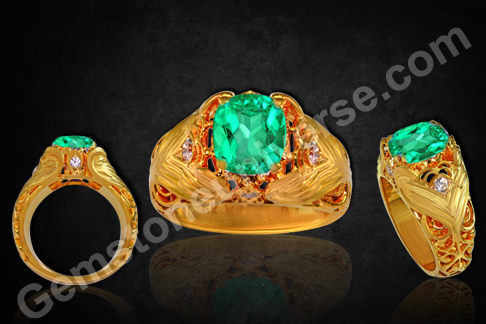 The cushion cut natural Colombian emerald is 2.92 carats in weight and has been set in an 18-karat ornate gold ring. The gem is absolutely sensational with minimal inclusions. Such level of clarity in a natural emerald is rare and therefore makes the gem a premium emerald. Aside of the good jyotish weight the gem scores exceptionally well on color as well, with a exotic deep rich emerald green color. The emerald is accented by four natural flawless diamonds, one in each direction, weighing a total of 20 points. Natural emerald or panna is the gemstone of Mercury/ Budh and set in a Mercury talisman it can give splendid jyotish results. We’ll stop the words here and let the spectacle of nature take over. Enjoy the gem and the talisman! He’s the lone ranger of Bollywood – the star whose life has been most unpredictable and speculated about. But he’s also the guy who rides smoothly with easy charm, ‘bad boy’ magnetism and unbeatable machismo, into the hearts of millions. 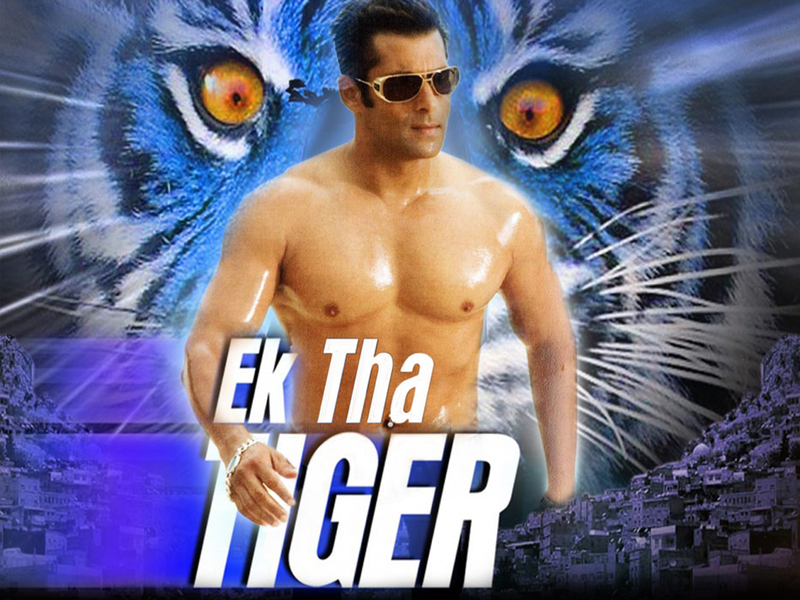 And what with numerous commercially successful films in his wake, Salman Khan is truly a superstar! What really catches attention about Salman Khan though is his Turquoise Gemstone bracelet that has been his lucky charm for nearly the last two decades. It’s a large sky blue turquoise gemstone that sits in a platinum chain around his wrist. As the story goes, his father the eminent scriptwriter, Salim Khan gifted him the bracelet long ago and he’s always worn it ever since. 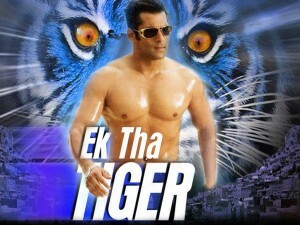 He will soon be seen in the new movie under the Yashraj Films (YRF) banner – ‘Ek Tha Tiger’ with Katrina Kaif, slated for release on the day of Eid 2012. He can be seen sporting the turquoise bracelet in the film too. Turquoise or Pheroza/ feroza gemstone is found widely in Tibet, Iran, Mexico and China. The color ranges from green to various shades of blue. Turquoise is a hydrous phosphate of copper and aluminum. It is usually fashioned as a cabochon, for it is an opaque gem. Turquoise gemstone is a gem that enhances the physical health and protects the wearer from evil. This gem is believed to change color, warning the wearer of impending danger. Metaphysical properties of Turquoise are many and among them what really stands out is that it helps one drop the negative energy and burdens of the past that obstruct personal progress. It helps an individual tap into one’s own intuition and set forward in pursuit of one’s destiny. Turquoise gemstone is a gem that was propably the earliest ones to be discovered. The Egyptians used the gem widely as well as the Aztecs, Pueblo Indians (who called it the ‘sky stone’) and also the people of Tibet. It was believed that the stone could invariably protect the wearer from accidents in journeys and battles, especially from falling off the horse. Turquoise gemstone as a healing gem has tremendous potential. In Vedic astrology, turquoise has the combined powers of Mercury as well as Ketu. The mystical element of Ketu brings in the sharpening of intuition and strengthening of the spiritual quotient of the individual. Turquoise helps an individual shun the trivial and move towards the essence of life. It is known as a ‘life stone’ in the oriental tradition and was kept on person life long, for connectedness with divinity and a firm rooting in reality. Salman Khan’s affinity for his bracelet has spawned a whole segment among his fans, who have got something in the likeness of his charm bracelet. The negative aspect of this trend is that plastic fashioned as turquoise, referred to as Taiwanese Turquoise, is being peddled widely and falsely as a genuine stone. The authentic turquoise has a smooth waxy top and a cabochon will always have a rough resinous bottom. Comments There are numerous gemstones and each one comes with something enigmatic and special about it. Nature has bestowed special attributes to them and that is precisely why they are gems. Featured today is a natural treatment free iolite of 3.12 carats from Madagascar set in sterling silver as a Saturn talisman ring. 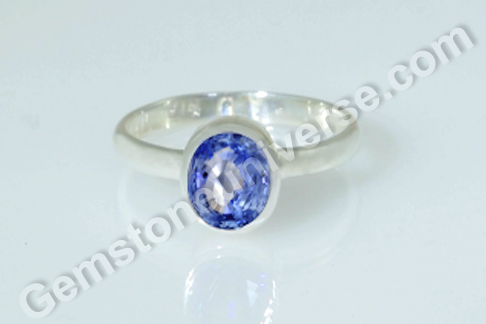 The oval shaped iolite is eye clean and has an enchanting royal bluish violet color. 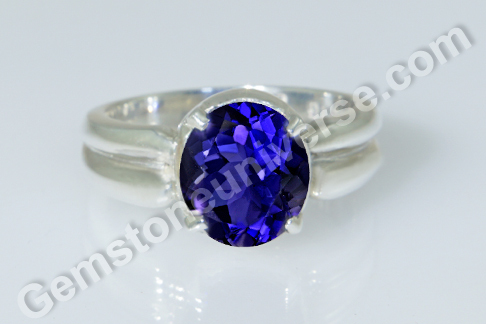 Iolite or Neeli is the substitute gem for natural blue sapphire or neelam. Iolite is the gemstone of Shani’s consort and is therefore also known as Shanipriya. The gem is used to harness the energies of Saturn and can bring some wonderful jyotish results. Not only was this gemstone used by the Vikings to navigate across seas, it also finds modern day usage in making of catalytic converters. Iolite is also known as dichroite or cordierite. It is a phenomenal gem that displays a special property known as pleochroism where the gem appears to have differnt shades of colors when viewed from different angles. In case of iolite the violet blue gem shows shaded ranging from yellow to brown on its surface. Comments Magical blue and fashioned spectacularly as well. It is a treat to be able to come across such a lovely looking gem. 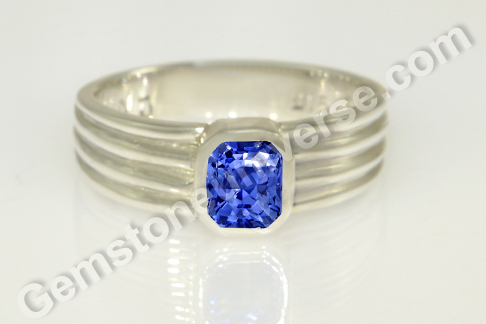 Featured today is a natural Ceylon Blue Sapphire of 2.02 carats set in Sterling Silver as a men’s Blue sapphire ring. The gem is completely natural and treatment free. This emerald cut blue sapphire has a shimmering electric blue color and is from the lot Cerulea 2012. The gem has an exceptionally appealing color and lustre. Natural Blue sapphire or Neelam gemstone is the gem of Lord Saturn or Shanidev also known as Shaneeshwara and Shani Mahatma. A talisman made with jyotish quality natural blue sapphire can help harness the saatvik energies of this planet. Tomorrow i.e. on May 20th, 2012 is the Shani Jayanti. The day marks the birth of Lord Saturn to Surya and Chhaaya and is widely celebrated. We wish all a day of sacred rejoicing. Comments What does one say about a color that is the color of nature itself! A vivid and very alive green that reminds you of the abundant wholesomeness of life. Of balance, unity and harmony. It is a color that instantly relaxes you and fosters tranquillity. Such is the gemstone featured today – a natural Peridot of 4.37 carats from Pakistan set in Sterling Silver as a Mercury Talisman. The captivating oval shaped gem has a golden olive green color with excellent clarity, as if it has captured the essence of the place where it was mined. Fantastic jyotish weight makes it the perfect choice for a good mercury talisman. 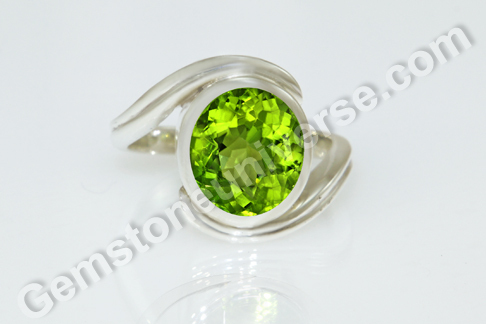 Natural Peridot or olivine or zabarjad gem is the substitute gem for natural emerald or panna. It is also the gemstone of Mercury. A natural unenhanced peridot can be used in a talisman to harness the energies of Mercury/ Budh. Peridot is formed over millions of years and is brought up because of volcanic activity. It is widely believed that the gem makes a person perceptive of the essential life force and open up to it. According to a famous legend, King Solomon traded cedar trees from Lebanon for 12 soma drinking cups made of Peridot. Soma was a drink that the Egyptian priests believed, if had in peridot cups could bring one closer to Goddess Isis. With mystic legends by no mortal hand.”PB Shelley wrote the lines, almost two hundred years ago but the depth and beauty of his writing continue to enthral even today. No wonder, for he understood the mysteries of nature and the miracles it was capable of. Featured today is one such gift of the seas, a completely natural and organic Australian Natural pearl. 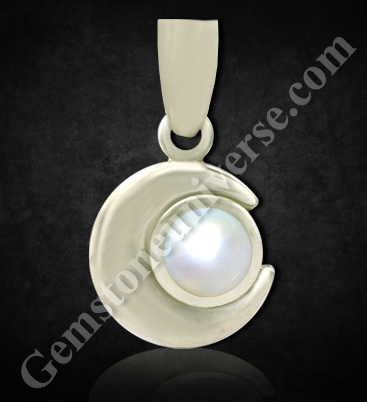 The natural pearl of 3.33 carats has been set in sterling silver as a Moon Talisman pendant. The button shaped natural pearl, which is white in color with light cream overtones, sits beautifully in a silver crescent moon design. The natural pearl is a jyotish quality pearl, which has lustre and desired translucence and comes with a pearl radiography report and certification. One must insist on this documentation to be provided while purchasing a natural pearl. Cultured pearls have no value and do not deliver results in planetary gem therapy. In Vedic astrology, natural pearl or Moti/ Mukta is the gemstone of Moon/ Chandra. Natural pearl, set into a talisman is used to harness the calm and stability imparting energies of the moon. Moon above all things is the significator of the mind and also of the element of divine feminine.